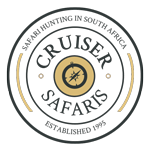 Cruiser Safaris Other Activities information: Raku Workshop, ClayInk Studios. ClayInk Studio, situated with breathtaking views over the Waterberg Mountains and Vaalwater, invites participants to enrich themselves through this life enhancing experience. The Raku process has been enthusiastically adopted worldwide since its origination in Japan in the latter part of the 16th century. “Raku” means happiness and it is also the name of a dynasty of Japanese potters whose works were often chosen by tea masters for the well known Japanese tea ceremony. 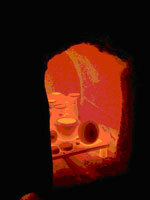 Clay, glazed and bisqued, is put into a hot kiln and when the glazed surface turns to a glassy shine like melting ice the clay article is pulled out hot, then smoked in a container with organic material and finally quenched in cold water to stop the heat action. 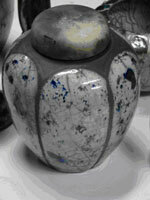 Popular modern Raku is often characterized by a velvety black body contrasted with black-stained crackle of white, blue or turquoise glaze. Each workshop participant will have the opportunity to select a ceramic article to decorate and glaze; participate in an exciting hands-on firing process and will take their article with after the completion f the workshop. 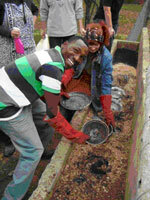 These workshops are aimed at a variety of ages and people from different walks of life. 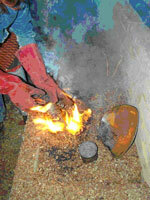 No prior experience or talent is required to enjoy the hands-on process of Raku. 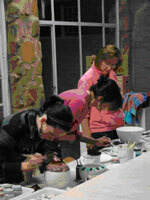 Advanced workshops are also offered to hobbyists or professionals. Children are however excluded from participating due to the fire, smoke & heat involved in the process. 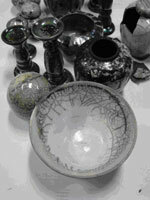 R1200 per/person - The fee includes a selected ceramic article, decoration and glaze materials, beverages and a light lunch. 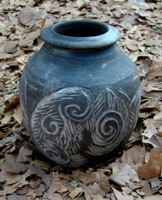 ClayInk Studios also has a small shop where premade made items may be purchased. If you are interested in this activity we ask that you please make note of your interest on the Preferences Questionnaire as it is necessary to make arrangements in advance to insure minimum and maximum Workshop participants. There is no charge for canceling later if you change your mind or time does not allow for this day trip.